Leadership events about personal growth, success and mindset principles. Thank you, Kim Ho. That was a fantastic workshop! I really enjoyed it and loved the information and how you presented it. Impressive and so important to our life's journey. Hi, my name is Kim Ho Leung and I’m an international Leadership Trainer, Mentor and Speaker. I’ve been practicing my vocation for the last 10 years. I have worked with many companies and universities, and I have guided thousands of people. I absolutely love to teach about personal leadership with The Hero’s Journey, and help people to find meaning and purpose in their life and business. My passion is to host leadership events to inspire and empower you. And to share easy tools and practices to super charge your daily life. Do you want to be a successful leader in your daily life? Do you wish to experience more joy, abundance and gratitude? Would you like to learn more about your own Hero’s Journey, so that you have more direction and you can start living a life of deep meaning and great purpose? If so, this might be something for you. 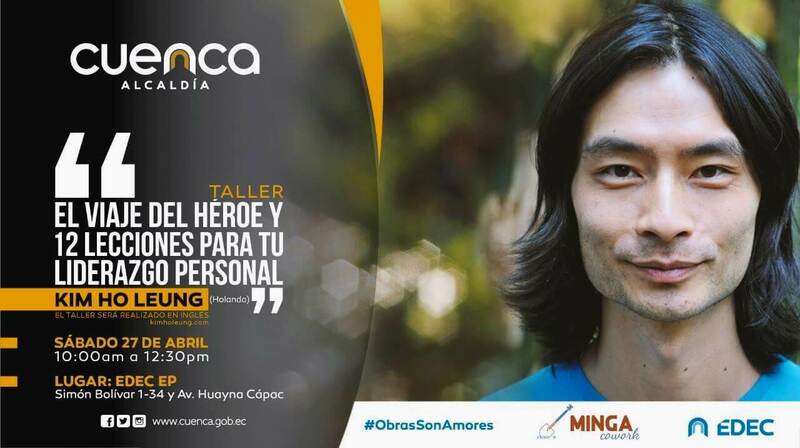 . .
On Saturday April 27th 2019, I’ll host an event about The Hero’s Journey, personal growth, and leadership in the beautiful world heritage city Cuenca, Ecuador. This event is in collaboration with EDEC EP, a governmental organisation in Cuenca. The workshop will be in English. It’s going to be a dynamic, interactive, and fun event where I’ll share about the 12 pillars of The Hero’s Journey and show you how you can recognize these steps in your life and business. I’ll illuminate the journey with powerful and inspiring movie clips to super charge your learning and understanding. Short exercises, and questions for reflection will be part of this workshop too. This day is an introduction to your own Hero’s Journey as you’re going to explore and enhance your leadership skills, and learn new ways of being, seeing, and thinking. Join me and your fellow students for this workshop filled with high energy, great inspiration, and positive vibes. 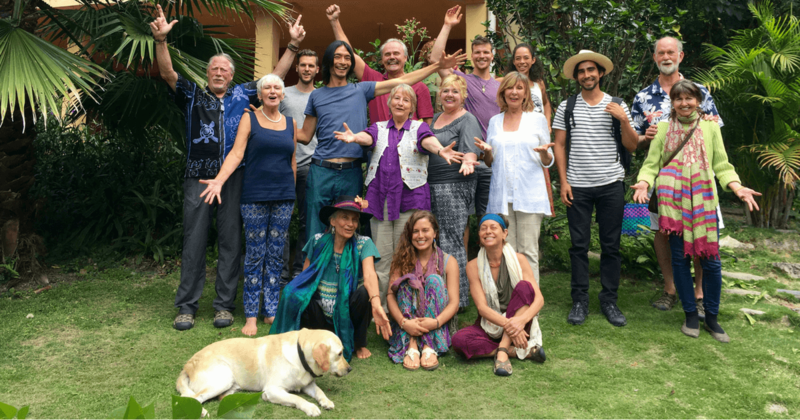 I’m super excited to guide you and look forward to co-create this event together! Reserve your seat. Preregister with EDEC EP here. Share this info about the Hero’s Journey workshop with friends who might be interested. Click the Facebook share button on the left. Scroll down for more testimonials. I felt very grateful and blessed to meet Kim Ho because I came more closer to my purpose and he helped me to better understand things of my life. Through his stories and teachings he inspired me to be brave and to show the world who I really am. Also working with him was very enriching because he's very funny, organised, dynamic and respectful. He showed videos, quotes, told his experiences, performed concentration exercises, and interacted with the public. I loved working with him! I'm very excited to continue learning because Kim Ho is a great professional, but most importantly, he's A GREAT HUMAN BEING". Thank you Kim Ho, for a most professional, yet personal presentation. I feel like I know you so much better than before. I can see a maturity beyond your years that commands my respect, and makes me eager to see/know/hear more from you." Working with Kim Ho was excellent. The workshop was dynamic and specific. I came back to believe in myself and reorganise my ideas to work again on the projects that allow me to enhance my abilities and skills." Daisha and I would like to thank you for your presentation on The Hero(ine)'s Journey. It was a super inspiring experience. The 12 phases, the movie clips and the energy in the room were very powerful. Seeing you performing with such deep passion made a big impression and inspired us to perform on stage too one day. 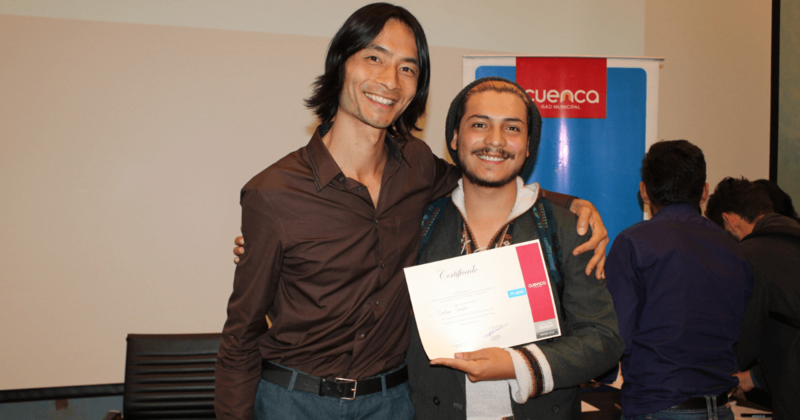 The workshop in Cuenca given by Kim Ho Leung was really valuable for me because I had the chance to see life from a different perspective and discover that there are many ways to learn about how to treat people and manage situations. Working with him was amazing because he knows how to interact with his audience and he could capture all our attention during the whole event. He used different materials in order to explain us what the workshop was about and gave us advice about how to improve ourselves in any way we want. I learned that in life every person goes through different stages when they want to achieve a goal. And in order to manage each of these stages, the very first thing that it is important is that we have to get to know ourselves how we really are and how we will react, so in that way it'd be easier for us to improve anything we want. We have to go step by step, learning every single situation and always giving the best of us. 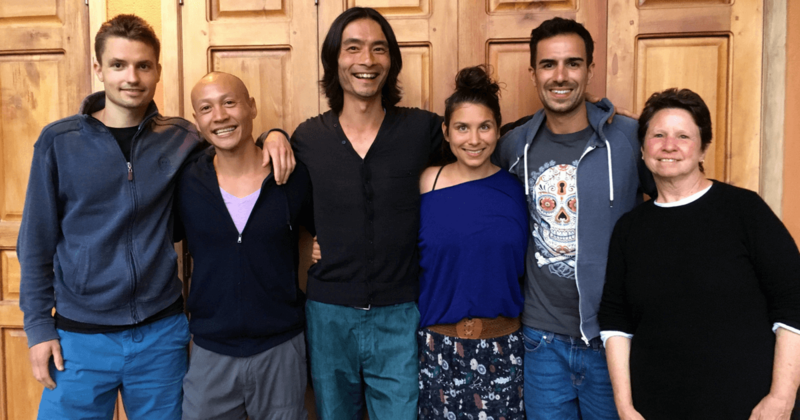 I definitely would recommend Kim Ho Leung's workshop because it's a big opportunity to open our mind to new concepts about how life, situations and people are and work." The workshop was amazing! I discovered so many things that I know they will help me for my entire life." The presentation was an amazing experience because Kim Ho knows about the topics and has much experience! He does his job very well and enjoys doing it." It was a pleasure to see Kim Ho in his element, sharing himself and his knowledge about The Hero’s Journey. It is clear he's following this path himself as he speaks from experience. His video presentations to help convey his message were a perfect aid to keep the presentation entertaining and easy to digest. They were very inspiring for us to help us rediscover our hero’s within. Thank you, Kim Ho, for guiding others along in your wake! We wish you and all of your participants continued success." El taller fue bastante valioso tanto desde el punto de vista académico como profesional, pues existen pasos necesarios para asegurar el éxito, trabajar con Kim Ho fue grandioso, transmite una gran energía. Me impacto la parte que se menciona que se requiere de un tutor o una imagen a seguir, para tener guía cuando uno tambalee, además que una vez alcanzado el éxito no se debe olvidar las raíces. Expreso un profundo agradecimiento pues el conocimiento adquirido es muy valioso, y quedo ansioso la fecha de publicación de su libro."